March 7, 2017 – Page 2 – Mister Journalism: "Reading, Sharing, Discussing, Learning"
The argument in favor of school choice continues to evolve, and post-DeVos, the conservative version is taking on its most honest form to date. It has been peeking its head out here and there for a while, but this week emerges full-blown in a US News piece from Robert Pondiscio (Fordham Institute). In “Asking the Wrong Questions on School Choice,” Pondiscio looks at the argument prompted by news that three major studies have shown that voucher programs show results somewhere between none and negative. Choice fans struck back by arguing the research. Pondiscio’s argument is that choice fans have let themselves get sucked into the wrong argument. And in making his case, Pondiscio has flipped a long-standing piece of the school choice debate on its head. His argument has two parts, two assumptions that he wants to question. First, he questions the assumption “that district schools have a place of privilege against which all other models must justify themselves.” This, as Andy Smarick has suggested in the past, is a rather non-conservative argument for conservatives to make, dismissing as it does a traditional institution. Second, he questions “that the sole purpose of schooling is to raise test scores.” Which, well, yes. I agree. 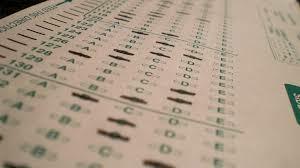 Using the Big Standardized Test scores to measure the effectiveness of schools is baloney. I’m pretty sure I’ve been saying so for years. Why are the people I’ve been arguing against on this issue suddenly agreeing with me? But this is the head-flippy part. “Deciding whether or not to permit parents to choose based on test-based evidence is presumptuous,” says Pondiscio, skipping over how we ever arrived at this point in the first place. And so reformsters embraced the BS Test, pushed the BS Test, used the BS Test as a crowbar for prying apart public education. We got such nifty ideas as the Achievement School Districts, where the schools with the bottom 5% of BS Test results would be turned over to someone with the authority to turn them charter. We have heard repeatedly for years now that choice must be allowed so that we can free poor students from failing school districts, and our whole basis for calling those schools “failing” has been BS Test results. We have heard endless calls to free students from their zip code if that zip code includes a school with low BS Test scores. School choice proponents who seek to prove that vouchers, tax credits and scholarships “work” by citing test-score-based research have allowed themselves to be lured into argument that can never be completely won. They have tacitly agreed to a reductive frame and a debate over what evidence is acceptable (test scores) and what it means to “win” (better test scores). That is incorrect. School choice proponents were not “lured” into this argument– they started it, set the terms of it, and used it relentlessly as a club with which to beat public schools. They didn’t “tacitly agree” to this reductive frame– they built the frame, varnished it, hung it, and demanded that everyone operate inside it. What has changed? Two things, mainly. One is the continuing schism in the reform movement between social justice reformers and free market reformers, a schism that Pondiscio himself marked almost a year ago. There are several fault lines, including the question of whether choice is best pursued universally for its own sake or directed at improving education for non-wealthy, non-white, and underserved students. The second is exemplified by the three studies noted above– choice-charter-voucher fans have now had years to test their ideas in the field, and they have no great successes to point to. They were going to take low-performing schools and turn them into oases of educational awesomeness. They didn’t. They set up the standard by which they wanted schools to be judged; they couldn’t show any particular success based on that standard. The question is not whether academic outcomes matter, but when they matter. Evidence should be used to influence school choice program and policy designs, not to decide whether or not choice should be permitted in the first place. The desirability of school choice and educational pluralism is a values-driven question, not an evidence-based one. Parents. Parental choice is not enough. The notion that the education system exists to serve parents is reductive, narrow, and mistaken. The educational system is meant to serve the entire community and the individual student. Don’t parents look out for students’ interests best? In the majority of cases, sure. But like every teacher, I can tell stories of students who would have been better off raised by wolves (the honor student whose mother was incarcerated for, among other things, trying to run over that child at age eight with a car, on purpose; the student who was often tired because of the parent who spent the money meant for heating bills on beer, so the trailer was always freezing). Organizing around just parent choice makes it difficult to maintain accountability to all taxpayers. There is a dark part of this argument that is still largely unspoken– yes, some parents will make lousy choices, and that’s too bad, but some people get the crappy lives that they deserve. It’s the same underlying argument that says if poor people want health care, they should stop making bad choices (like iphones). It’s an old conservative argument– some people should suffer the unpleasant consequences of their bad life choices and not be rescued by the government (using my hard-earned tax dollars). But this argument falls apart when we are talking about making a child suffer the consequences for a parent’s lousy choices. That’s both morally indefensible and a poor way to build a better future for the nation. Money. There’s no reason to believe that we can finance multiple school systems for the price of one. “Cash is tight, so let’s open multiple facilities,” said no business ever. If we really want to do choice right, it will require politicians who stand up and say, “We’re going to spend more tax dollars on education so that all these choices can be available.” But in some states, we can’t even get folks to fully fund the single public system they’ve got. Regulation. Students cannot afford to lose a year or two of education while the market shakes out fraudsters and scammers. Students cannot afford to lose a year or two of education because some educational amateur is better at marketing than actual educating. For the same reason that public schools should be held accountable– because no child should have one minute of her education wasted– choice schools should also be held accountable to all students, parents, and taxpayers. This last one is where the rubber meets the road. Some people believe in choice because that is their personal value. Some people believe it will improve education. And some people don’t really care– they are just frustrated that their business can’t get at that sweet, sweet education money because there are too many hoops to jump through and too many rules that get in their way. These choice fans inevitably identify themselves by arguing for few-or-none regulations, because every regulation is one more obstacle to their quest for profit. There’s one other regulatory issue– a widespread choice system could be put in place without having the slightest effect on social justice and educational equity. Because somebody is going to decide which choices are available in which communities. This is where the reform community is itself having a bit of a stew– because reformers who want to bring educational equity to non-wealthy non-white students do not have the same priorities as reformers who want to transform the nation’s system into a choice-based one– and both groups have figured out that, particularly under the current administration, they can perhaps be more successful if they don’t have to pretend to support the other group’s agenda. So if we could address all those issues, then a choice system might be possible. But it will take more than choice supporters divorcing themselves from the test-centered system that they foisted on all of us to get there. I’m not sorry that the conversation has arrived at this point– I feel that if nothing else, it’s at least honest. Some choice fans feel that a choice system should be put in place because it’s the right thing to do. Which, oddly enough, is how I feel about a public education system based in every community and run by locally-elected taxpayers. I will be interested to see where this new version of the reform argument takes us. “For centuries, societies have crafted written standards to protect individuals and to promote their basic human rights. Two extraordinary examples were the Magna Carta of 1215 and the US Bill of Rights in 1791. On Sunday, one of the two major business publications in West Michigan, ran a front page article headline, As Betsy DeVos takes Cabinet post, family to continue community engagement . The MiBiz article presents Betsy DeVos and the rest of the DeVos Family as, “inextricably woven into the community.” This is not an inaccurate statement, rather a statement from a certain perspective. Those of us who write about local politics might call it a process of population management or social control. On Sunday, one of the two major business publications in West Michigan, ran a front page article headline, As Betsy DeVos takes Cabinet post, family to continue community engagement. Report advocates a “big bet” on innovative schools but doesn’t confront likely challenges or limitations. Reimagining Learning: A Big Bet on the Future of American Education for the Think Twice Think Tank Review Project at the National Education Policy Center, housed at University of Colorado Boulder’s School of Education.Professor Snyder cautions that the report overpromises. He explains that the report fails to provide a meaningful examination of research or a thorough basis for its recommendations. His critique focuses on six key concerns: the report fails to consider human capital constraints or to sufficiently consider obstacles confronting classroom technology usage; it overlooks equity concerns and past problems with dependence on external professional services; and it ignores both the potential for disruptive reform churn and the danger of philanthropic efforts altering public education systems in undemocratic ways. Although the report provides valuable insights via a glimpse into where some of the most influential players in the philanthropic sector see investments heading, Professor Snyder concludes that its usefulness to policy and practice is limited.